For the football player, see Hank Ketcham (American football). Henry King Ketcham (March 14, 1920 – June 1, 2001) was an American cartoonist who created the Dennis the Menace comic strip, writing and drawing it from 1951 to 1994, when he retired from drawing the daily cartoon and took up painting full-time in his home studio. In 1953, he received the Reuben Award for the strip, which continues today in the hands of other artists. Born in Seattle, Washington, Ketcham was the son of Weaver Vinson Ketcham and Virginia King. His great-grandfather was James Weaver, who ran for President twice on third party tickets in the late 19th century. When Ketcham was six years old, his father had a guest over for dinner who was an illustrator. After dinner, he showed the youngster his "magic pencil" and drew some illustrations. Ketcham was immediately hooked, and soon his father set up a small desk in the closet of his bedroom at which he could draw. After graduating from Queen Anne High School in 1937, he attended the University of Washington but dropped out after his first year and hitchhiked to Los Angeles, hoping to work for Walt Disney. After World War II, he settled in Carmel, California, and began work as a freelance cartoonist. In 1951, he started Dennis The Menace, based on his own four-year-old son Dennis. 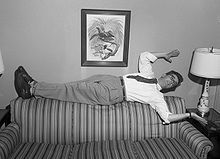 Ketcham was in his studio in October 1950, when his first wife, Alice Mahar, burst into the studio and complained that their four-year-old, Dennis, had wrecked his bedroom instead of napping. "Your son is a menace," she shouted. Within five months, 16 newspapers began carrying the adventures of the impish but innocent "Dennis the Menace." By May 1953, 193 newspapers in the United States and 52 abroad were carrying the strip to 30 million readers. The real-life Dennis was 12 in 1959 when his mother died of a drug overdose. Mr. Ketcham took the boy to live with him in Geneva, where he spent some 20 years before moving back to California in 1977. But Dennis had difficulty with his schooling and was sent to boarding school in Connecticut while Mr. Ketcham remained in Switzerland with his second wife, the former Jo Anne Stevens. The marriage ended in divorce. Dennis Ketcham served in Vietnam, suffered post-traumatic stress disorder and had little contact with his father. "He's living in the East somewhere doing his own thing," Mr. Ketcham said in March. "That's just a chapter that was a short one that closed, which unfortunately happens in some families." When his Dennis the Menace cartoon added a Sunday strip, Ketcham hired artist Al Wiseman and writer Fred Toole to produce the Sunday strips and the many Dennis The Menace comic books that were published. People from around the country sent captions to him, and he would find one that he liked and illustrate the gag. In 1990, Ketcham published a memoir titled The Merchant of Dennis the Menace (reprinted by Fantagraphics in 2005), chronicling his career. He retired from drawing the daily panel in 1994, at which time his former assistants, Marcus Hamilton and Ron Ferdinand, took over. At the time of Ketcham's death, Dennis the Menace was distributed to more than 1,000 newspapers in 48 countries and 19 languages, by King Features Syndicate. Ketcham spent his last years in retirement at his home in Carmel, California, painting in oil and watercolor. Many of his paintings can be seen in a hospital in nearby Monterey. He died in Carmel, of prostate cancer on June 1, 2001. He was survived by his oldest son, Dennis, his third wife, Rolande, and their two children, Dania and Scott. In 2005, Fantagraphics Books started publishing what was to be a complete Dennis by Ketcham from the start of the strip, collecting two years per volume, but the publishing ceased in 2009 with the 1961-1962 volume. ^ a b c d e f Van Gelder, Lawrence (2001-06-02). "Hank Ketcham, Father of Dennis the Menace, Dies at 81". The New York Times. Retrieved 2007-11-24. ^ "Creator of 'Dennis The Menace' dies at 81". Berkeley Daily Planet. 2001-06-02. Retrieved 2007-11-24. ^ "Markstein, Don. ''Half Hitch''". Toonopedia.com. 1970-02-16. Retrieved 2014-01-13. ^ "Find a Grave". findagrave.com. 2013-12-20. Retrieved 2018-11-11. ^ "Words about Pictures". Hembeck.com. 2003-12-21. Retrieved 2014-01-13. Ketcham, Hank. The Merchant of Dennis. New York: Abbeville Press, 1990.